Tornado HQ now has an experimental live-updating page. You can track as many locations as you like and be notified with a voice alert (if your browser supports it) when any of your locations is affected by severe weather. If you want to see ALL severe weather warnings, go to the severe weather map page. At 1042 PM EDT, a severe thunderstorm capable of producing a tornado was located near Ansonia, moving northeast at 30 mph. At 1014 PM EDT, a severe thunderstorm capable of producing a tornado was located near Union City, moving northeast at 30 mph. At 1001 PM EDT, a severe thunderstorm capable of producing a tornado was located 8 miles northwest of New Madison, moving northeast at 30 mph. At 915 PM EDT, a severe thunderstorm capable of producing a tornado was located over Union City, moving northeast at 25 mph. At 910 PM EDT, a severe thunderstorm capable of producing a tornado was located 7 miles northwest of Rushville, or 18 miles northeast of Shelbyville, moving northeast at 35 mph. At 906 PM EDT, a severe thunderstorm capable of producing a tornado was located over Union City, or 14 miles northwest of Greenville, moving northeast at 25 mph. At 856 PM EDT, a severe thunderstorm capable of producing a tornado was located over Connersville, moving northeast at 35 mph. At 810 PM EDT, a severe thunderstorm capable of producing a tornado was located near Greensburg, or 9 miles west of Batesville, moving northeast at 35 mph. At 752 PM EDT, a severe thunderstorm capable of producing a tornado was located 9 miles west of Osgood, or 16 miles southwest of Batesville, moving northeast at 35 mph. At 127 PM CDT, a severe thunderstorm capable of producing a tornado was located over Donaldsonville, moving northeast at 40 mph. At 1125 AM CDT, a severe thunderstorm capable of producing a tornado was located over Kiln, or near Diamondhead, moving northeast at 40 mph. At 916 AM CDT, a severe thunderstorm capable of producing a tornado was located over Norco, or near Hahnville, moving northeast at 30 mph. At 458 AM CDT, a severe thunderstorm capable of producing a tornado was located near Sugartown, moving northeast at 60 mph. At 437 AM CDT, a severe thunderstorm capable of producing a tornado was located over Singer, moving northeast at 45 mph. At 411 AM CDT, a severe thunderstorm capable of producing a tornado was located over Wisner, or 12 miles southeast of Winnsboro, moving northeast at 40 mph. At 336 AM CDT, a severe thunderstorm capable of producing a tornado was located over Enterprise, or 17 miles southeast of Columbia, moving northeast at 55 mph. At 309 AM CDT, a severe thunderstorm capable of producing a tornado was located 5 miles northwest of Jena, moving northeast at 30 mph. At 214 AM CDT, a severe thunderstorm capable of producing a tornado was located 5 miles south of Farmerville, or 16 miles northwest of Claiborne, moving northeast at 40 mph. At 137 AM CDT, a severe thunderstorm capable of producing a tornado was located 7 miles southwest of Grambling, moving northeast at 45 mph. At 101 AM CDT, a severe thunderstorm capable of producing a tornado was located 12 miles southeast of Ringgold, or 24 miles west of Jonesboro, moving northeast at 45 mph. * Until 1115 PM EDT. tornado was located near Ansonia, moving northeast at 30 mph. Speedway, Carthagena and Maria Stein. submit your report via social media, when you can do so safely. * Until 1045 PM EDT. tornado was located near Union City, moving northeast at 30 mph. Union City, Sharps Crossing and Sharpeye. * Until 945 PM EDT. was located over Union City, moving northeast at 25 mph. Union City, Eldora Speedway, North Dayton, Rose Hill and Cosmos. of Shelbyville, moving northeast at 35 mph. Knightstown and Mays around 920 PM EDT. Dunreith around 925 PM EDT. Spiceland, Lewisville and Greensboro around 930 PM EDT. Straughn around 935 PM EDT. New Castle around 940 PM EDT. This includes Interstate 70 between mile markers 118 and 133. * Until 930 PM EDT. Union City around 910 PM EDT. was located over Connersville, moving northeast at 35 mph. Germantown, Mettel Field and Beesons. * Until 830 PM EDT. Lake Santee and Clarksburg around 825 PM EDT. New Salem around 830 PM EDT. This includes Interstate 74 between mile markers 134 and 144. Batesville, moving northeast at 35 mph. southeastern Decatur and northeastern Jennings Counties. * Until 200 PM CDT. was located over Donaldsonville, moving northeast at 40 mph. Gonzales around 145 PM CDT. Lyman around 1150 AM CDT. Gulfport and Saucier around 1200 PM CDT. * Until 1000 AM CDT. * Until 530 AM CDT. was located near Sugartown, moving northeast at 60 mph. Pitkin and Fullerton around 510 AM CDT. Elizabeth around 515 AM CDT. * Until 515 AM CDT. was located over Singer, moving northeast at 45 mph. Tulla around 450 AM CDT. Newlight around 430 AM CDT. Newellton around 445 AM CDT. Somerset around 450 AM CDT. Afton around 500 AM CDT. moving northeast at 55 mph. Jigger around 350 AM CDT. Wisner around 355 AM CDT. Newlight around 410 AM CDT. * Until 400 AM CDT. Jena around 315 AM CDT. * Until 300 AM CDT. northwest of Claiborne, moving northeast at 40 mph. campus from a likely tornado. Bayou D Arbonne Lake, Spencer, Linville, Haile and Rocky Branch. * Until 215 AM CDT. Bayou D Arbonne Lake, Mineral Springs, Unionville and Eureka. Jonesboro, moving northeast at 45 mph. If you're looking for older warnings, we now have an experimental tornado warning archive for today's tornado warnings and the past 48 hours of warnings. Older warnings are coming soon. Tornado watches are red. 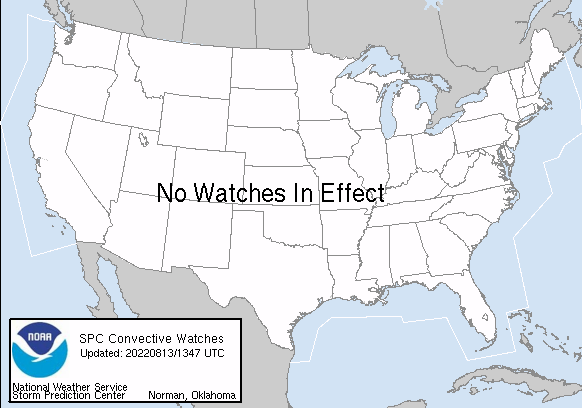 Severe thunderstorm watches are blue. Remember to check out severe weather outlook for more severe weather and cyclocane for hurricanes. We've got a new experiment: tornado solitaire. On the Tornado Solitaire website you can play your favorite card games whilst keeping tabs on the US severe weather warnings.